Spears are used for thrusting in the hand and also as throwing weapons. Many spears were probably used in both ways. Only the heavier, longer spears could not be thrown - at least at close quarters. bit the Earl, Æthelreds's thane. flung back the filed spear, again it flew. 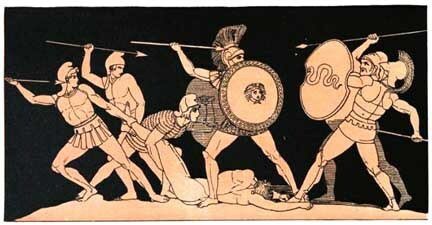 A Homeric struggle-maybe even the Maldon poet had this famous forebear in mind ? Spears are thrown in ancient warfare and tribal warfare. Everyone threw them and specialists threw them. They were for chucking at attackers from besieged walls, for skirmishing at a distance, for piling through shields and armour and for slaughtering horses or for sniping. Throwing spears were everywhere in warfare.